This image shows incredible details of a crater with gullies that provides strong evidence for gully formation involving fluid flow. The gullies on the north wall have eroded all the way to the crater rim. They appear older than other nearby gullies because they have existed long enough to be modified by permafrost processes as evidenced by the polgyonal fractures found on some of the channel and inter-gully walls. Another noticeable difference among the gullies is channel lengths. The gullies on the north wall and the group just to the left of these have much shorter channels than the gullies on the northwest wall. 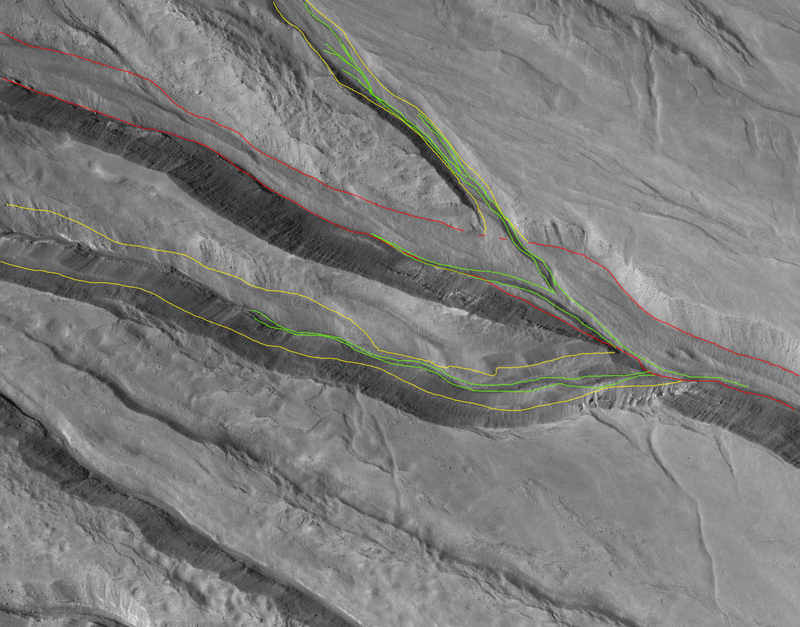 It is possible that the gullies with shorter channels had less fluid flow through their systems. The gullies appear to originate around a sequence of rocky layers near the crater rim. Many of the gully channels appear to have boulders littered in many places. This suggests a fluid flowing in these channels; a fluid would preferentially transport smaller particles and leave behind the larger ones, such as the boulders visible here. There are also many small channels in each gully. These indicate multiple flow events such that some channels experience flow, then are abandoned. The closeup image also shows several channels merging. Particularly interesting is the channel flowing from the top of the scene. There are several intertwining channels that merge into one just to the right of the center of the subimage. However, the way some channels truncate others suggests that there were at least three episodes of flow through this area. This is a stereo pair with ESP_011969_1425.